A new generation discovers a classic! The Sovereign States: Notes of a Citizen of Virginia, presents the best explanation we have found of the proper view of our Federal Unionthis great Confederate Republic, composed of free, sovereign and independent States. 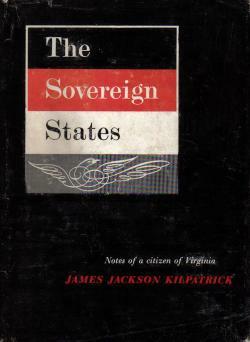 Written during the Southern resistance to the Brown v. Board of Education decree of 1954, author James J. Kilpatrick presents a clear and lucid exposition, accessible to the lay reader, of the founding of our present Constitutional Republic, the historic events that have shaped it, and the challenges we face today to restore constitutional government and preserve liberty under law for ourselves and our posterity. The book entered the Public Domain in the mid-1980s, and this Web presentation is offered to the Public Domain in the interest of educating liberty-loving Americans in protecting our freedoms and way of life. Our goal in this online presentation has been to preserve the look and feel of the book as much as possible while at the same time leveraging the advantages of HTML to maximize its use as a reference. All footnotes are reciprocally linked to their respective note entries, and links are provided to original source materials (especially court cases) wherever possible. Even the index has been retained, with links to embedded page numbers in the text. We highly recommend this important volume to all students of American government. and is not authorized or endorsed by James J. Kilpatrick. Author of the Conservative Debate Handbook. Author of Nine Men Against America.  C. Vann Woodward in Commentary Magazine. Nothing is more obviously needed in this country in our time than a review of fundamentals on which the greatness of our country restsand return and rededication to these fundamentals. In The Sovereign States Jack Kilpatrick, one of the nation’s most brilliant young editors, has made a great and timely contribution to facilitate meeting this need. The book is a wonderfully documented presentation of a vital segment of the source of strength in our form of government. (from the original back cover). “When he wrote The Sovereign States, Kilpatrick was editor of the Richmond News-Leader. This book, which was published in 1957, may properly be considered, I think, the southern reply to Brown vs. Board of Education, the Supreme Court decision of May 17, 1954, which undertook to put an end to racial separation in the public schools. Although the school decision was the immediate stimulus to the writing of the book, its concern is with the much larger issue of the usurpation by Washington of the authority of the states. “Kilpatrick is a fine stylist, and he developed his thesis with the eloquence of the great Virginia orators he so much admires. Our government, Kilpatrick argues, was constitutionally intended to be a federation of sovereign states jointly controlling their mutual agent, the federal government. It is true that the sovereign states jointly delegated some of their powers, but they did not become less sovereign thereafter. They remained separate, respective states. Although the Fourteenth Amendment has greatly weakened the power of the individual states, as has the income-tax amendment, the states still have the means to protect themselves if they would use it. This was the “right of interposition,” as developed by James Madison in his report of 1799 to the Virginia House of Delegates during the great controversy that resulted from the Alien and Sedition Acts. . . .